Delivering Wi-Fi AC1200 dual band speeds to your home network, the DIR-850L is the perfect solution for those looking to enjoy online gaming, multiple HD video streams, and fast file transfers – all with less wireless interference for maximum throughput. Use the 2.4 GHz band for everyday tasks, while leaving the high-speed 5 GHz AC band free for HD video streaming, online gaming and large file transfers. With fewer devices using the high-speed 5 GHz band, there’s less interference and congestion, giving you better performance and a lag-free wireless experience. With its high powered amplifier the DIR-850L creates a wireless signal that reaches farther than most Wireless N and 11AC routers. 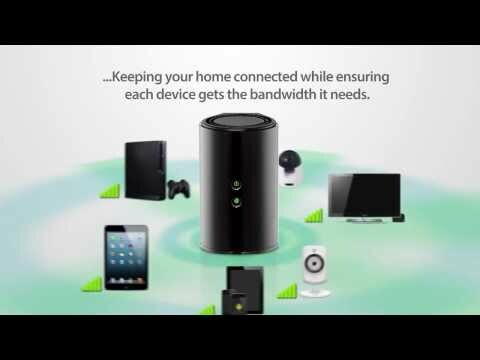 Eliminate wireless deadzones and experience whole-home coverage with the Wi-Fi AC1200 Router. Monitor your network no matter where you are. See who is connected to your router, change settings, or block someone from using your network connection. Plug in a USB storage device and instantly create your own personal cloud storage for playing your media files remotely using a smartphone or tablet.